I made these. Hee hee. I’m as surprised as anyone at how easy it is to make Homemade English Muffins, all while your family sleeps. When my family came downstairs this morning and met me in the kitchen, I had a grin on my face a mile wide. Care for an English Muffin? When I found this five star English Muffin recipe with over 100 favorable reviews I felt confident I could pull it off. Now that I have, I’m here to encourage you to do the same. All the ingredients go into your bread machine, set on the dough mode. The original recipe called for 3 cups of flour, but several of the reviews suggested adding a little extra to avoid a sticky dough. I added two extra tablespoons and my dough was perfect and easy to work with. I didn’t have a 3-inch round cookie cutter so instead I cut the dough into 8 equal pieces and formed them into 1/2-inch thick discs by hand. All good English Muffins have those nice cornmeal dusted edges. Be sure to press both sides of the dough into the cornmeal, then transfer them to parchment lined baking sheets and cover with plastic wrap. After a 30 minute rest they will have almost doubled in size and are ready to be pan grilled. Heat your cast iron skillet or griddle over a low flame. You can cook them in a dry skillet but I found a very, very light coating of canola oil gave them a nice golden finish. Let them cook for 5-7 minutes per side. They should be nicely browned. I couldn’t wait to slice one open and check for nooks & crannies. Can you see them? Maybe not quite as many as the popular store bought brand, but plenty to hold a drizzle of honey or jam. And when we make our Eggs Benedict ~ Two Ways, our Homemade English Muffins will sit proudly on the plate. Put all ingredients through yeast into bread machine pan, in order listed. Start the dough cycle. Line two baking sheets with parchment paper. 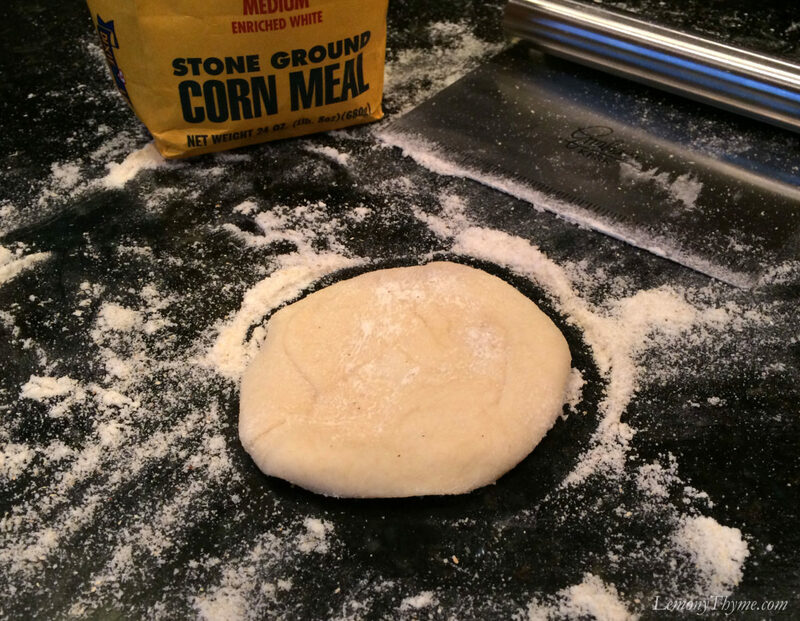 When dough is finished, sprinkle cornmeal over work surface. Pour dough onto work surface and pat into a ½-inch thick circle. Cut into 8-10 equal size pieces. Use either a 3-inch circle cutter or cut into wedges and form into discs by hand. Press both sides of each piece into cornmeal, then transfer to parchment lined baking sheet. Cover with plastic wrap and allow to rise about 30 minutes, until not quite double in size. Heat dry cast iron skillet or griddle over a low flame. Once hot, use a paper towel dipped in canola oil to very lightly grease pan. Working in batches, cook the muffins for 5 - 7 minutes per side. They should be golden brown when you turn them. Split with a fork or serrated knife. Best served warm. Can be frozen and reheated in the toaster. Can I substitute original almond milk for milk? Hope you enjoy them Happel. I warmed the milk and added the butter, sugar, and salt to it before adding the egg which I had lightly beaten. Then added bread flour and the yeast. Easy peasy! They were wonderful with jam. So glad you enjoyed them Norma. They’re a family favorite here too. I never thought I could made English muffins in a bread machine. This is a must try especially that I haven’t used my machine for quite some time. Can you suggest a healthier alternative for the flour? I’ll admit I’m not an expert on how different types of flour respond in baking. I know there are some really great gluten free baking mixes out there, as well as whole wheat flours. Just not sure how they’ll work for these English muffins. If you give something different a try, I’d love to hear how it worked out. I made these today for Eggs Benedict and they were absolutely perfect. I cooked them on the griddle at 300 degrees for 6 minutes a side and they weren’t quite ready. I turned a heavy sheet pan over on top of them and gave them a couple more minutes per side and they were just right. I’ll be making these again. Delicious! Thanks Libby. Fantastic Donna. I like your idea of using the griddle with the sheet pan to weigh them down. We’ve got just a couple left in the freezer but for our next batch I’m going to make 12 instead of 8 and use my bacon press. Other than that no changes.